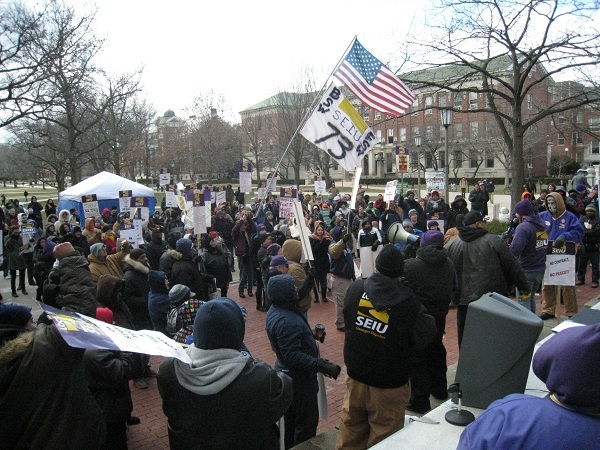 Congratulations to our friends in SEIU who conducted a very successful strike in defense of the living standards for themselves and their families. It is now up to the university to make a decent settlement with the union. The short strike was an excellent test of labor solidarity and the unions came through with flying colors. As usual, GEO supplied great spirit and person power on the lines, including our first roving bicycle picket line. Members of the trades sacrificed their own incomes to show solidarity and some delivery drivers refused to cross the lines. AFSCME members appeared on the lines and everyone joined together at a large rally to celebrate the end of strike. CFA collected more than $1000 for our food drive, with contributions still coming in. Faculty appeared on picket lines around the campus. Should it be necessary to resume the strike, union brothers and sisters will be back out on the line with SEIU colleagues and we will resume the food drive. We all love our work and are dedicated to the University of Illinois. Our efforts in the strike are to make our university a better place.